I am proud to introduce to you, one of my beautiful partners who is making huge change in the world. She is helping me bring the beautiful message out into the world contained in the film Beauty in Darkness. It is a delight to have her here. and you walk into the center of the room and turn on the tiny flashlight. but the light will always brighten the darkness. really no one can take away the power from you. Only you can give it away. Only you choose to turn dim or switch down. Its not about the people in your life. Personal message from Crystal about her challenges, triumph and invitation to become partner with her through the SWAT institute. Grab a copy of her books now! 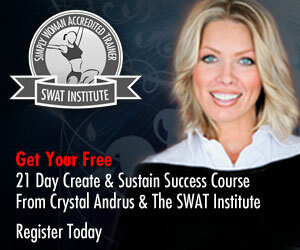 Crystal Andrus gives away FREE mp3 downloads of her coaching programs and discussion with inspirational women worldwide that can help women open their eyes to the greatness of being a woman. * Are you a love Addict? * What is your dominant Energy? – Woman, daughter, or Mother Energy? This entry was posted in BEAUTIFUL STORIES and tagged beautiful stories, book, challenges, Crystal Andrus, friends, gift, partners, simply woman, swat institute. Bookmark the permalink.